Published in the South Kent Gazette, 28 January, 1981. Five years after the Wellington pavilion was cleared away, the land opposite the Maison Dieu Hall was offered for sale in separate plots for building leases; and in the following year the row of houses named St. Martin’s Terrace was built, the land being leased for 80 years from the 25th of March, 1844, under the usual covenants of the Dover Priory Estate, subject to ground rents equally apportioned between the ten houses of £40 a year payable to the Archbishop of Canterbury, £2 10s. a year to the Rector of St. James’s, and £1 5s. a year to the Perpetual Curate of Whitfield. In 1903 the forecourts of these houses were purchased by the Corporation to widen the street in front of the Municipal buildings. Subsequently all the houses were converted into shops or restaurants. At the foot of Priory Hill, until 1899, there stood a row of buildings which probably were built about the same time as Trafalgar Place, adjoining. These stood out into High Street in line with the front gardens below, making that part of High Street its narrowest part. This property was offered for sale by auction in 1899; when the bidding reached £4,050 it was withdrawn from the sale, but was afterwards sold privately, the Corporation taking sufficient of the frontage to set back the street in line with St. Martin’s Terrace and the houses above Victoria Crescent, including the first and the last of the houses, being taken to complete the widening. The remainder of the land between Priory Hill road and Victoria Crescent was used by the Dover Congregationalists to build their new church, which from its opening in 1904, has been one of the most prominent architectural features of High Street. The tower rises to a height of 80 feet from the roadway and is a conspicuous feature being finished above the roof level with Corsham stone. The joint architects were Messrs. Cress-well and Newman and Mr. W. Beeston, and the builders Messrs. G. and R. Brisley. The length of the buildings is 66 feet 11 inches, including the space occupied by the lobby at the main entrance. The width is 44 feet 8 inches, and the extreme height 41 feet 3 inches, and has a tower at the south-western angle. The general style is ornamental Gothic of the Lancastrian period. The building is mainly faced with Kentish rag, embellished with fine white Corsham stone dressings, the ornamental upper part of the tower being chiefly of that beautiful material. Internally, the church was divided on the floor into a nave, two side aisles and a spacious narthex along the front into which opened three entrances. Over the aisles and lobby was constructed a gallery, carried all round the building except at the pulpit end, and above this a clerestory, lighted by three windows on each side. The galleries, unlike those in some churches which are a mere disfiguring addition, were very elegant, having the appearance of an extra spacious triforium. The pulpit recess, under which, in addition to the pulpit, were sited the organ, the choir seats and the Communion table, was covered by a lofty Gothic arch of rather earlier style than the other portion of the building. A recess at the other end was narrowed to accommodate each side of it the gallery staircases. The main entrance from High Street was enriched with sculptured stonework and surmounted by a very fine Gothic window. The entire cost of the building, including the site, was over £9,000. Now known as the United Reformed Church, the building underwent considerable changes in 1957. Closed for six months, services being switched to the Biggin Hall, the lofty interior of the church was completely transformed by converting it into two storeys. The church moved upstairs to the first floor leaving space below for a hall. The massive pillars and beams of the church were finished in dark delphinium blue, the walls given an off-white finish and there was some red and gold ornamentation. The organ console was placed to one side of the organ pipes which were located in the centre of the platform end of the building. A form of reredos in light blue finish was erected across the church, screening the organ and the lower part of the pipes from the congregation. The platform was placed in front with a pulpit on the right-hand side. A section of the inside of the bell tower was utilised to form a gallery. The cost of the alterations and a modern heating system was about £8,500. The church was re-opened and dedicated by the then Minister, the Reverend H. Rex Coombs, assisted by the Reverend R. S. J. Lewis, secretary of the Kent Congregational Association, and the Reverend A. P. Lansdown, Minister of the Radnor Park Congregational Church, at Folkestone, early in December 1957. Victoria Crescent, next above the church, was built about the year 1838 by Alderman W. Dickenson, a paper-maker, who had a mill where Wood Street timber yard, now a car park, was located by the river. This Crescent was built on an Archbishop’s lease, and the whole of the houses in it being offered for sale in 1850, it was a condition that if the houses were sold to different owners, they should jointly contribute to keep up the ornamental garden in front. A little further up the street, on the same side, was a notorious rookery known as Barwick’s Alley. It was built about the year 1823. Cramped and deficient in sanitary conveniences, which no authority enforced at that period, it was, from the beginning, anything but a desirable locality, and in course of years it so degenerated that when Mr. Rawlinson reported on Dover in connection with the introduction of the Health of Towns Act, he graphically dwelt on its sordidness; yet it is a singular fact that when the smallpox visited Dover in 1612, there was not a case in this alley, the grim joke of that period being that the epidemic looked in but was afraid to enter! Soon after Dr. Robinson became Medical Officer of Health for Dover he, in 1875, condemned the whole of the alley as being unfit for human habitation; but it was several years before the local authority found a way of giving effect to his verdict. There were 36 people living in the alley at the time it was condemned; several of the inhabitants had been there 40 years, and it was claimed that they were all hale and hearty. Eventually, in 1882, the Town Council raised a loan of £900, and with that the alley was “improved off the face of the earth." The Salvation Army Citadel was built more or less at the entrance to this one-time slum. 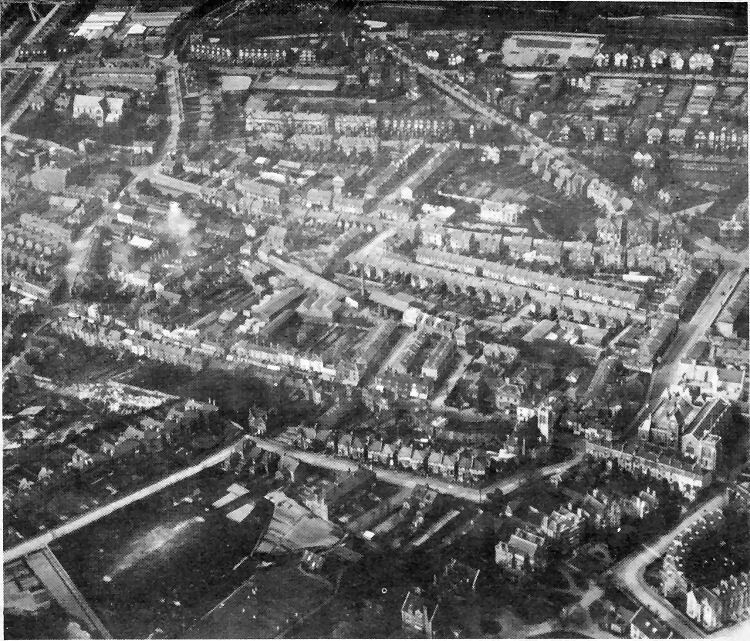 AN aerial view, believed to date from the early or mid 1930s of the town centre area between the Town Hall, on the right, to the High Street junction with Bridge Street and Tower Hamlets Road, on the left. It shows clearly not only the great changes that have taken place since the Second World War in High Street but also in the Bridge Street-Charlton Green area, where many properties have disappeared. Behind what is now the Sainsbury supermarket is the site of William Crandall’s once extensive timber yard alongside the River Dour. Near the Town Hall the tall tower of the United Reformed Church can be seen adjacent to the sweep of Victoria Crescent. At Charlton Green there were Alma Place, Charlton Villas, Dour Side, Dour View Cottages, Castle Cottages, Cook’s Cottages and Palmerstone Terrace when this photograph was taken.